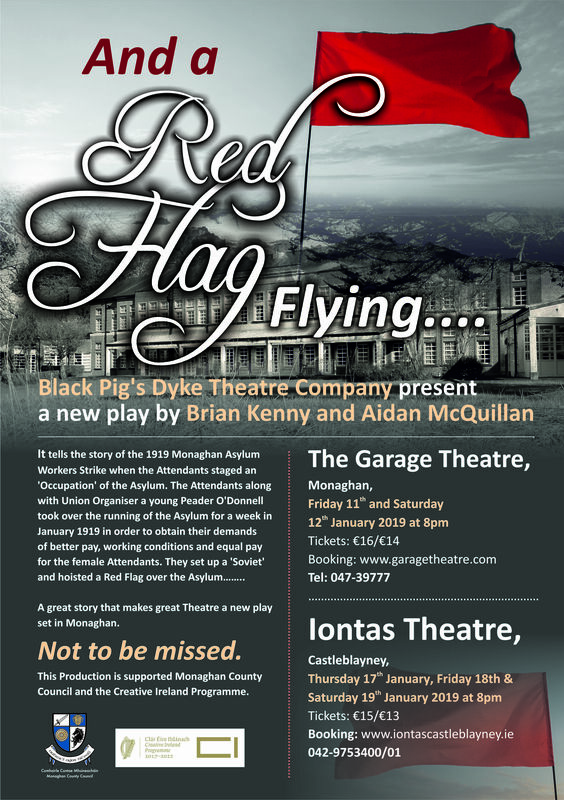 Black Pig's Dyke Theatre Company present a new play by Brian Kenny and Aidan McQuillan at The Garage Theatre, Monaghan on Friday 11th and Saturday 12th January 2019 at 8pm, and at the Iontas Theatre, Castleblayney on Thursday 17th and Saturday 19th January 2019 at 8pm. 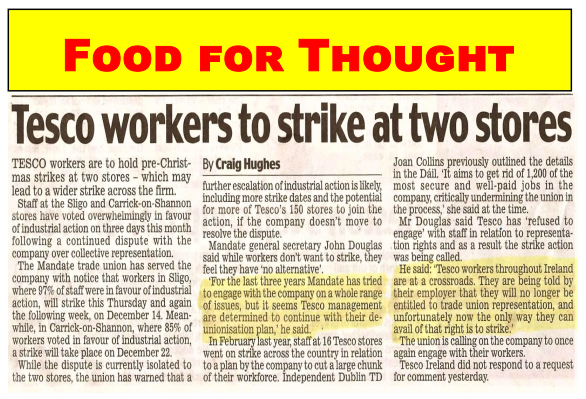 Tesco workers are to hold pre-Christmas strikes at two stores in Sligo and Carrick-on-Shannon, which may lead to a wider strike across the firm. 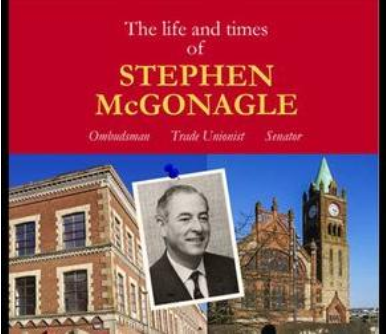 The Irish Labour History Society and the Northern Ireland Committee of the Irish Congress of Trade Unions are jointly organising a conference in the MAC in Belfast the weekend of Friday 19th/Saturday 20th October 2018. 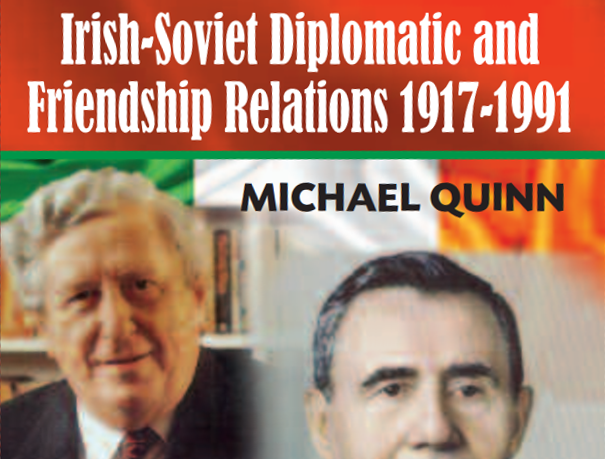 The conference will see a number of historical talks including Michael Mecham, Emmet O'Connor, Myrtle Hill and Seán Byers. 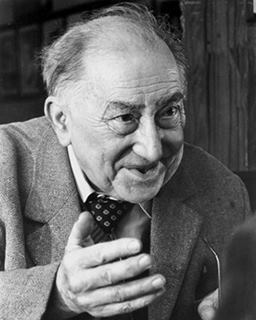 A new collection of essays on William Walker will also be launched on the Friday evening. 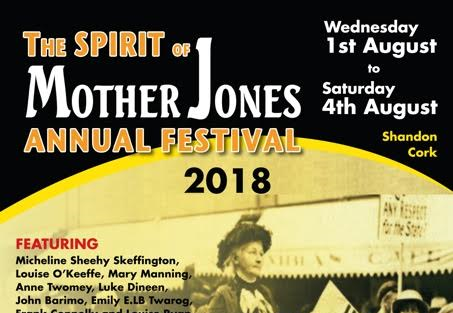 A festival and summer school dedicated to the memory of Mary Harris/Mother Jones and to inspirational people everywhere who fight for social justice. 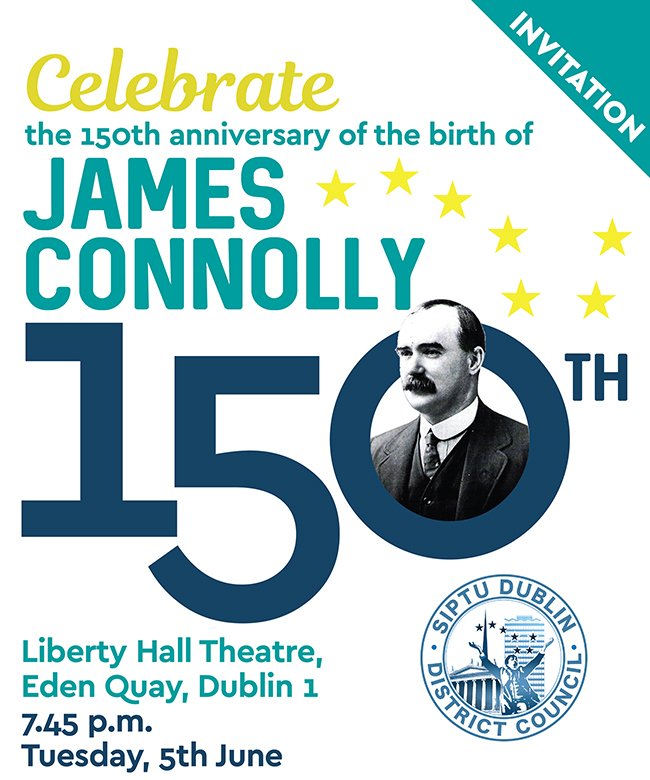 The SIPTU Dublin District Council cordially invites you to: A night of celebrating James Connolly - the foremost thinker, writer and organiser in the history of trade unionism in Ireland. An address by Lord Mayor of Dublin, Cllr. Mícheál Mac Donncha. A series of short documentary films, based around the SIPTU Dublin District Council Irish Citizen Army Community Plaques Project in 2016. A Hooley for James - an evening of songs and music with light refreshments in the Connolly Hall and Cois Life Bar. Free entry. If you wish to join us please contact the SIPTU Dublin District Council at dublindistrict@siptu.ie or 01 858 8235, to confirm attendance. There are two more events to choose from, marking the Anti-Conscription Centenary, both on 23rd April. 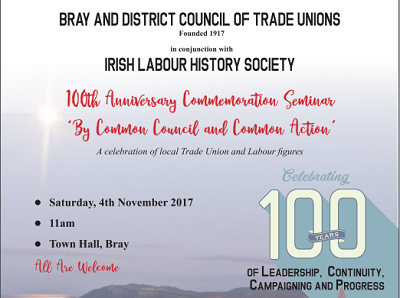 The Wicklow Constituency Council of the Labour Party, are sponsoring a public lecture to mark the Centenary. 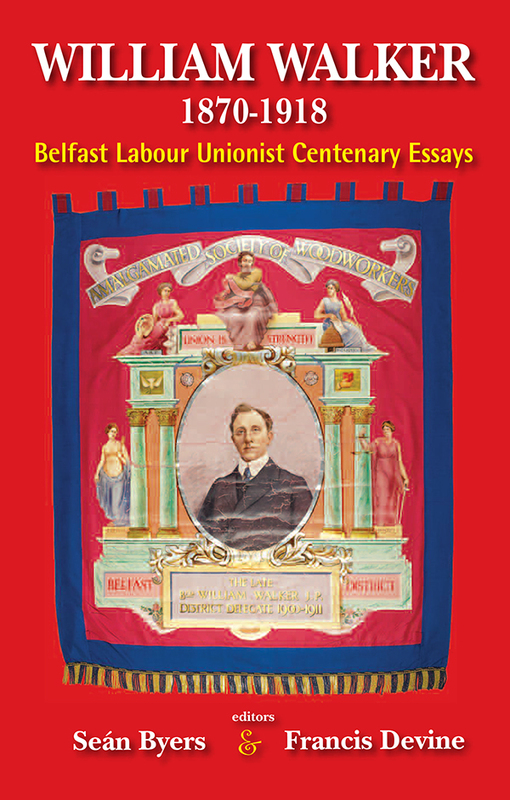 It will be delivered by Labour Historian and ILHS member Charlie Callan. 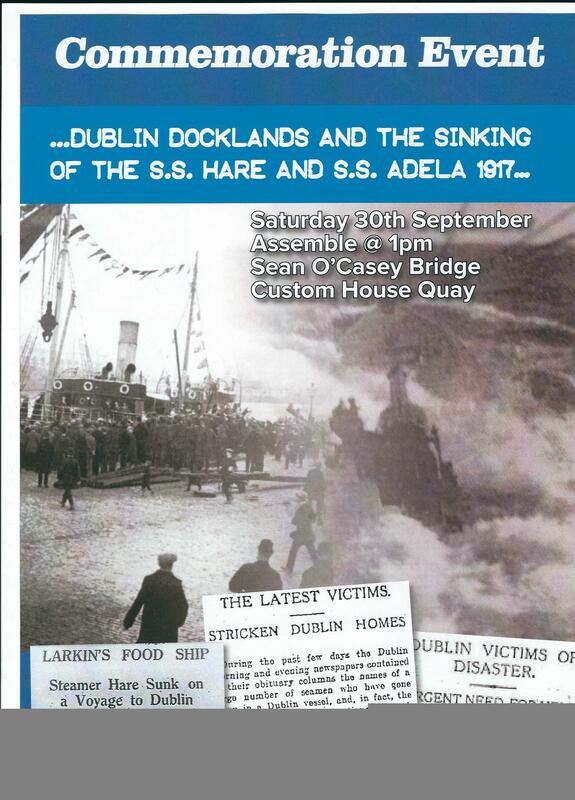 The event will be chaired by Jack O Connor, Chairperson of the Labour Party. 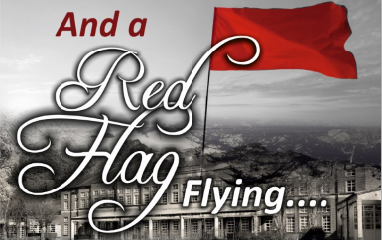 It's at 8pm in The Grand Hotel, Wicklow Town on Monday 23rd April. 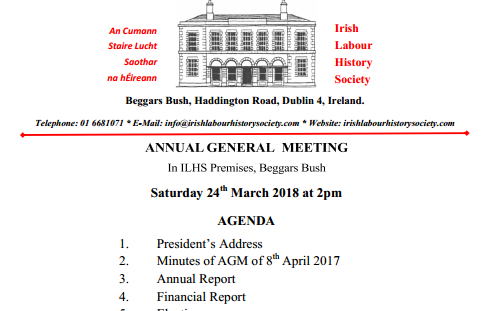 All IHLS members are welcome. 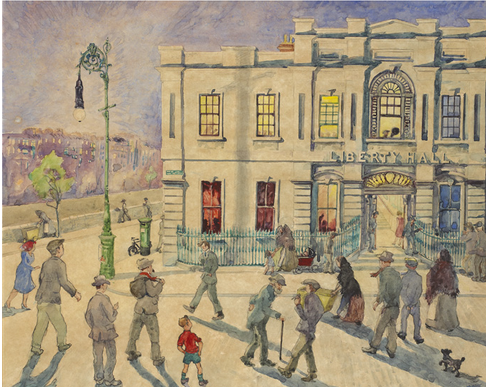 Also on Monday 23 April 2018 a History Ireland ‘Hedge School’ debate will take place in Liberty Hall, Dublin 1, on the subject of ‘The cause of Labour? 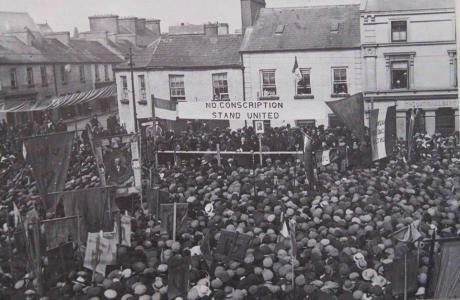 The 1918 general strike against conscription. The Hedge School will take place at 7pm. Admission free, all welcome. 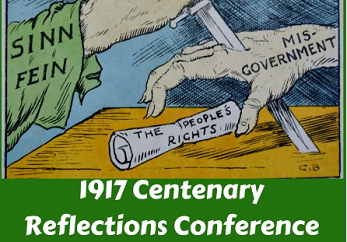 Exactly 100 years after the Mansion House Conference against Conscription was convened by Lord Mayor Laurence O'Neill, the Lord Mayor of Dublin Mícheál Mac Donncha will host a range of speakers on various topics from the historical roles of those involved on that day in 1918 to the impact on modern day life. in the Round Room at the Mansion House, Dublin on Wednesday, 18th April 2018 from 10.30am to 3pm. 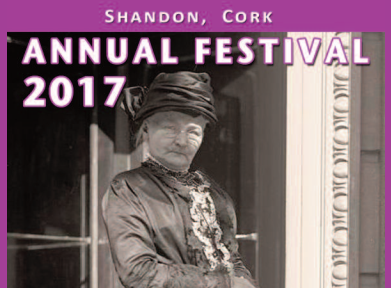 3:40pm: Launch of Saothar 43 (co-edited by Sarah-Anne Buckley & Martin Maguire) Available for members to collect on the day. 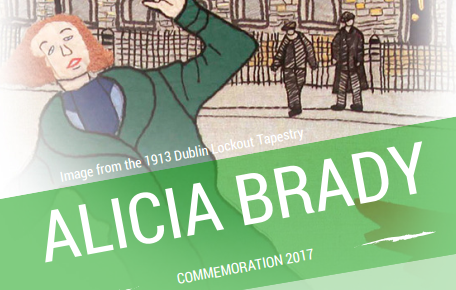 Join us for a talk by Nell Regan, music from Eric Fleming, history and the presentation of the Alicia Brady Award for Workers' Rights Activism. Wreath Laying at St. Mark's Church, Pearse Street, Dublin. Followed by Event in the Pearse Centre on Pearse Street. 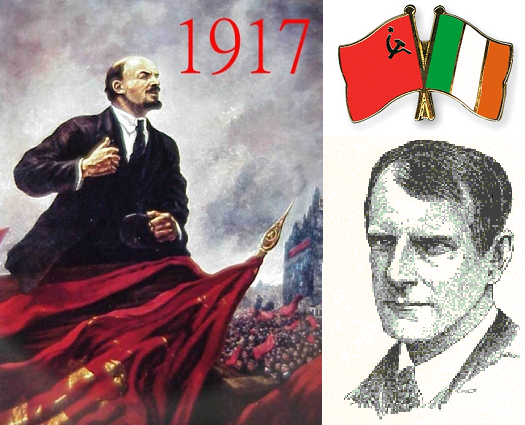 As part of the Dublin Festival of History, the Irish Labour History Society have helped organise a seminar to mark the centenary of the Russian Revolution of 1917 and to consider some of the impacts it had in Ireland particularly on the Irish labour movement. Seminar speakers include Donal Fallon, Conor Kostick, Emmet O'Connor & Kate O'Malley. 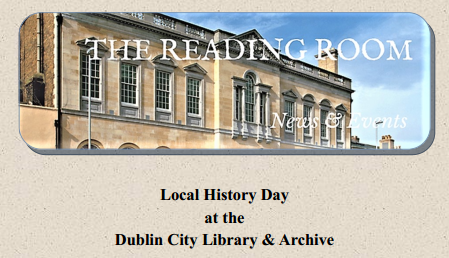 This event is taking place in Dublin City Library and Archive, Pearse Street, Dublin on Saturday 7th October, 2-4.30pm. No booking is required. All welcome on a first come, first served basis. The Limerick Soviet Centenary Committee is planning special celebrations - a special festival of artistic, cultural, historical and political events - for the 100th anniversary of the Limerick Soviet. With over eighteen months to go to the occasion now is a good time for all who see the value and the possibilities of the project to come together with any ideas you might have to flesh out the plans. The possibilities are endless so a brainstorming session might give us direction. 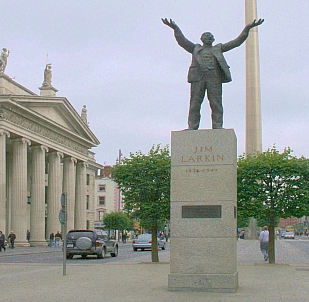 The celebrations could be a major event in Limerick with contributions to its final shape coming from individuals or groups in their own areas of expertise. We would like to invite you to a meeting at the GAFF, 36 Cecil St, Limerick for 6pm, Monday, September 25. 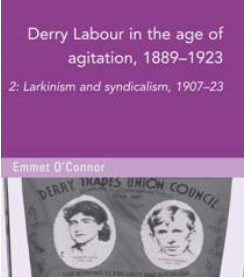 Talks by Brian Hanley - 'The layers of an onion': labour, class and post-Rising Ireland' and Sarah-Anne Buckley - 1916 to Irish women's suffrage: gender, class and the politics of motherhood feature in the Seminar: The death of political pluralism? 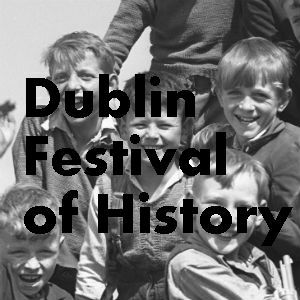 Ireland after the Rising 1916-18 on Saturday 9th September 2017 at Glasnevin Cemetery Museum, Finglas Road, Dublin 11. 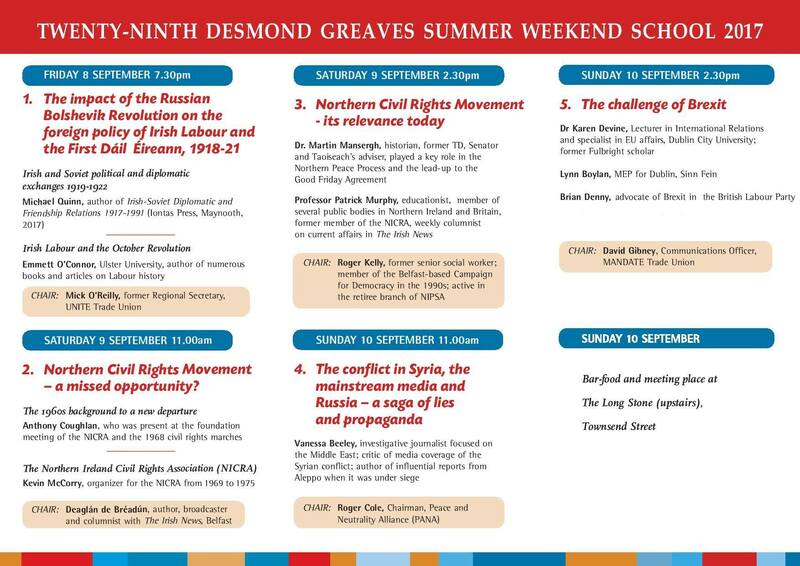 This year’s Desmond Greaves School will open with a session marking the centenary of the 1917 Russian Revolution with talks from Michael Quinn -Irish and Soviet political and diplomatic exchanges 1919-1922, and Emmett O'Connor - Irish Labour and the October Revolution at 7.30pm, Friday 8th September in the Pearse Centre, 27 Pearse Street, Dublin. The full programme runs from the 8th to 10th September. in the dlr Lexicon, Moran Park, Dun Laoghaire, Co. Dublin. 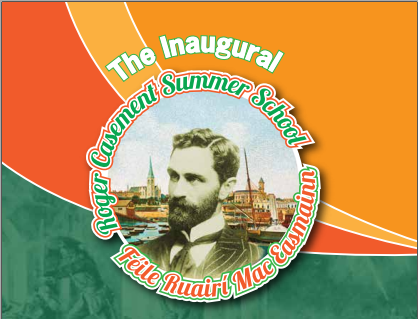 The inaugural Roger Casement Summer School will cover such themes as Roger Casement and his times and human rights issues with speakers from Ireland, The Democratic Republic of the Congo and Peru. 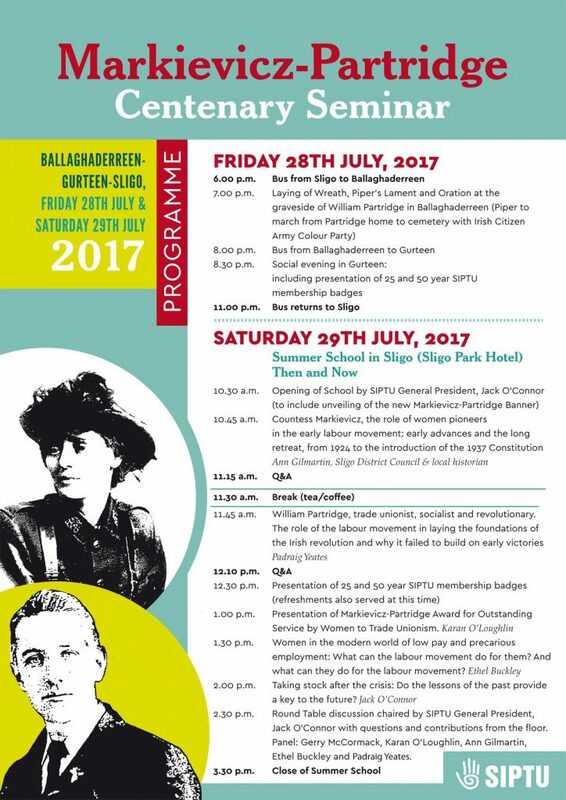 The Markievicz-Partridge Seminar will take place in Ballaghaderreen and Gurteen on Friday 28th July, from 7pm and in Sligo on Saturday 29th July, from 10.30am. Kilmainham Tales. Teo. 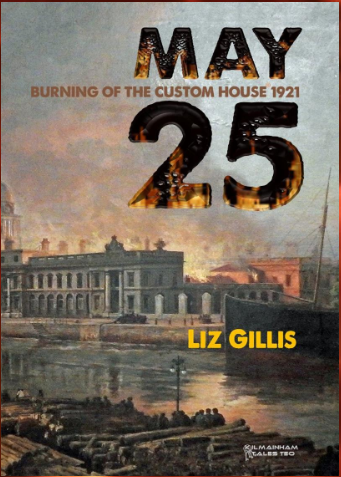 invites you to the official launch of May 25 - Burning of the Custom House 1921 by Liz Gillis in ILHS, Beggar's Bush, Dublin on Wednesday 21st June at 6.30pm. 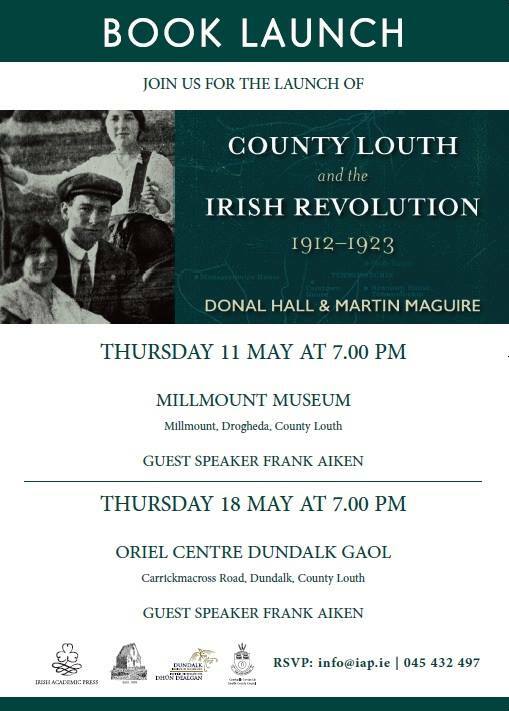 Members of the Irish Labour History Society are invited to attend the launch of this publication on County Louth and the Irish Revolution on 11th May, 7pm at Millmount Museum, Drogheda, Co Louth, and 18th May, 7pm at the Oriel Centre, Dundalk Gaol, Carrickmacross Rd, Dundalk, Co Louth. 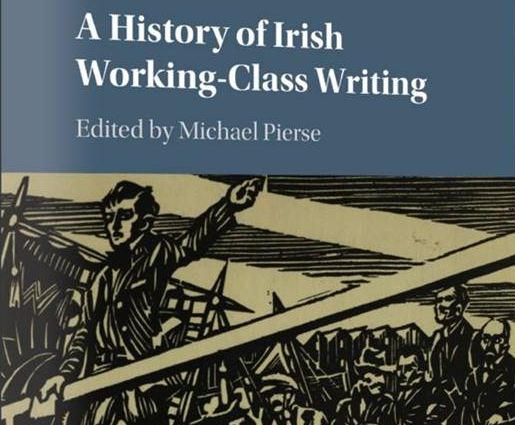 It is co-edited by Saothar editor Martin Maguire and includes a chapter on Labour in County Louth during this period written by Martin (it also includes a chapter by ILHS member Peter Rigney on the Railways in County Louth). 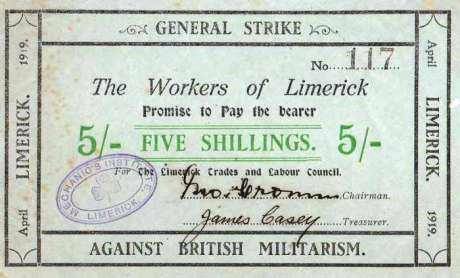 The conference, which is on 5-6th May at Gleason’s Townhouse Hotel & The Abbey Hotel, Roscommon, will include a number of talks relating to labour history, including 'William Partridge, the Workers’ Republic, and 1916: the Ballaghaderreen connection' by Padraig Yeates, and 'Jim Larkin’s 1917 American Irish Worker' by James Curry on saturday morning. 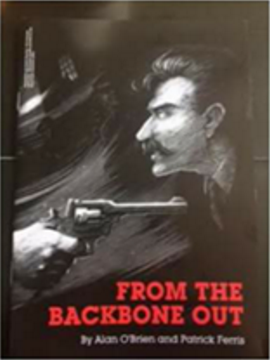 Another chance to see 'From the Backbone Out' at Liberty Hall Theatre, Eden Quay, Dublin on Wednesday 3rd May and Thursday 4th May 2017 at 8 pm. Tickets only €10. 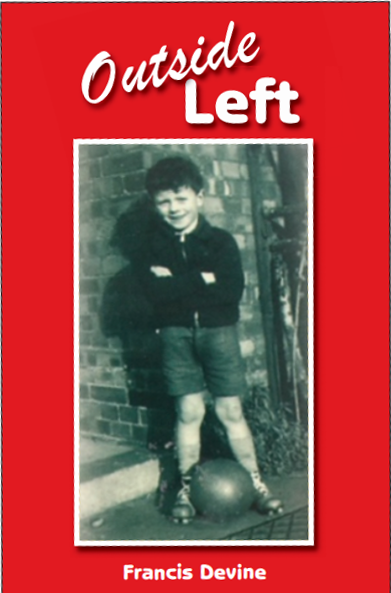 The Play centres on Councillor Richard O'Carroll (1876-1916), his life and his achievements. 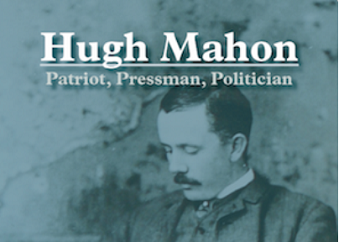 The launch of 'Hugh Mahon, Patriot, Pressman, Politician Volume 1: the years from 1857 to 1901' by Jeff Kildea will take place at The Royal Irish Academy, Dawson Street, Dublin on Wednesday 26 April 2017 at 6 pm, also at Offaly History Centre, Bury Quay, Tullamore, Co. Offaly on Thursday 27 April 2017 at 8 pm, and New Ross Historical Society Boat Club, Rosbercon, New Ross, Co. Wexford on Friday 28 April 2017 at 8 pm. 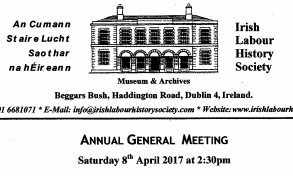 The WHAI Annual Conference will take place at NUI Galway on 21-22 April, 2017 and is being organised in association with the Irish Centre for the Histories of Labour and Class. 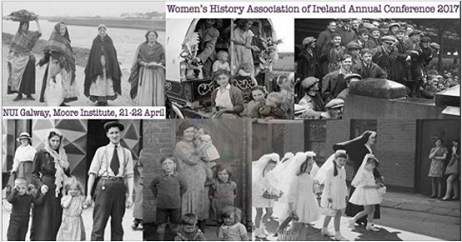 The theme of the conference is ‘Gender and class in Ireland’. Follow this link to view the final conference programme, to register and for information on travel and accommodation options. 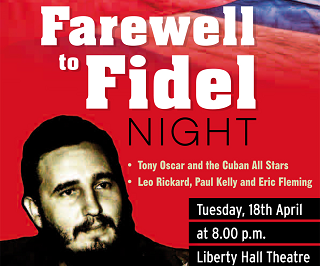 with Tony Oscar and the Cuban All Stars, Leo Rickard, Paul Kelly and Eric Fleming on Tuesday, 18th April at 8.00 pm in Liberty Hall Theatre, Eden Quay, Dublin. Thursday 26th January 2017 at 6.00pm Teacher's Club, Parnell Square, Dublin 1.